The unlikely Odyssey of George W. Bush. As the principal New York Times reporter assigned to cover George W. Bush's presidential campaign from its earliest stages – and then as a White House correspondent – Frank Bruni has spent as much time around Bush over the last two years as any other reporter. In Ambling Into History, Bruni paints the most thorough, balanced, eloquent and lively portrait yet of a man in many ways ill–suited to the office he sought and won, focusing on small moments that often escaped the news media's notice. 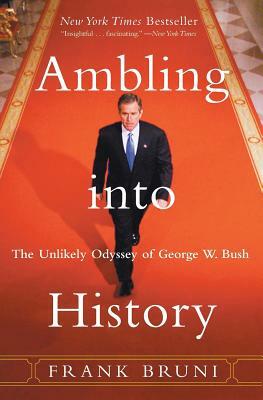 From the author's initial introduction to Bush through a nutty election night and Bush's first months in office, Bruni captures the president's familiar and less familiar oddities and takes readers on an often funny, usually irreverent, journey into the strange, closed universe – or bubble – of campaign life. The result is an original take on the political process and a detailed study of George W. Bush as most people have never seen him. Frank Bruni, a reporter in the Washington bureau of the New York Times, now writes full-time for the Times Sunday magazine. For his previous work on other subjects, he was named a finalist for the Pulitzer Prize for feature writing and a winner of the Polk Award for Metropolitan Reporting. He has appeared on ABC-TV's Nightline and other programs to talk about the Bush campaign and presidency.